An Iraqi girl displaced from her home waits in line with her mother for aid in Baghdad's Sadr City. Karima Rasool Ridha looks older than her 40 years, but it's not surprising, given the life she's leading. Karima used to have a house in Baghdad, a comparatively comfortable existence. That ended when masked men came, telling her to leave her home and everything in it or she and her son would die. Karima is now one of an estimated 1.5 million Iraqis forced from their homes by their country's sectarian bloodletting. Last year, reports say, up to a thousand people fled their own homes every single day. Karima is Shia, forced out by Sunni extremists. But it works both ways: Shia also force Sunni to run for their lives. Many move in with family members in already crowded houses. Others leave the country, if they can afford it. People like Karima end up in so-called "camps for internally displaced persons." It's a bureaucratic term for what are actually quite chilling places. Karima's new home is a filthy, sewage and garbage-ridden plot of land she shares with dozens of other families. Her 16-year-old son does little during the day, as there's no school, no work, and little safety outside their fetid enclosure. Iraq's prime minister has promised to help people get back to their homes, their old communities. But the stark reality on the ground is that people like Karima won't go. "I don't trust his words. I don't believe it," she says. "There's no safety in going back." Is U.S. obliged to accept Iraqi refugees? Imagine this: A foreign power invades your country, and when it becomes unsafe for you to continue living in your home, that foreign power closes its doors, denying you a visa to escape the violence. That is what is happening to roughly 1.5 million Iraqis who have been forced from their homes as a result of sectarian violence. Hundreds of thousands more have trekked across the border to Syria and Jordan. So why aren't they coming to the United States? The figures vary from year-to-year, but in last year, the United States budgeted enough to accept 54,000 refugees. Still, it only accepted 202 Iraqi refugees last year. Since the U.S.-led invasion in 2003, fewer than 500 Iraqis have been granted visas into the United States. One of the lucky refugees is a woman we'll call "Sarah." She asked us not to use her real name to protect her family. Now living in Morristown, New Jersey, "Sarah" told me her family was targeted by insurgents because she greeted U.S. troops with flowers when they arrived and is thrilled Saddam Hussein is gone. The moment she knew she had to leave occurred during her commute to work one morning. "In the middle of the road we started to notice a car following us. It was following us for a long time," she said. "We noted that there are three men in the car, they were carrying guns, they were aiming the guns at us and they started shooting. We were terrified. We started shouting. It was so scary." It took six months for her to get a visa for the United States. Still, the rest of her family never even got one. Her parents are now bouncing between her brother in England and her sister in Scotland. Another sister living in Canada just had a baby which "Sarah" isn't even able to see, because her paperwork doesn't allow her to visit Canada. Looking back, she says she wishes the invasion never happened, because she can't go back to Iraq. Many of the refugees seeking asylum in the United States are translators who have supported the U.S. war effort. One testified recently on Capitol Hill about the growing danger. He too did not want to be identified, but said this: "The killings were gruesome. Iraqi citizens, including translators, have been shot in the head or beheaded, but only after terrorists forced these people to 'confess' that they were spies and agents of the United States." The White House has taken heat for not doing more. "Our invasion of Iraq led to this crisis, and we have a clear responsibility to do more to ease it," said Sen. Ted Kennedy (D-MA). Yesterday, the U.S. State Department announced it will spend an additional $18 million to help settle Iraqi refugees worldwide and that the United States plans to accept as many as 7,000 Iraqi refugees this year. But is that too little too late? What is the United States' moral obligation to these people? Industrial activity takes place on land that was once pristine rainforest. From the air, the Amazon appears overwhelming. An apparently continuous canopy of green, dark and rich, it seems to stretch to the horizon. That's deceiving, of course. The Amazon basin is about 2.7 million square miles, a little smaller than the area of the lower 48 states. Up close, you see that it is not continuous at all. I've never been much of an environmentalist. I tend to pay more attention to politics and international conflicts. But seeing what is happening here, it's hard not to feel the planet is under a lot of pressure: An area of forest about the size of New Jersey is cut down every year; twenty percent of the forest has been cut and burned in the last 40 years; and while the deforestation rate has slowed somewhat the past two years, the threat to this valuable ecosystem is very real. Wildlife biologist Jeff Corwin and I just got back from two days with an indigenous group called the Kraho. They are farmers and hunters who are fighting hard to keep their land intact. We went hunting with the Kraho this morning. Last night, Jeff and I went out into the forest to look for wildlife. Tonight, we'll show you a portion of what we saw with the Kraho. This is the first step in an ongoing series of reports from all over the world we are producing this year called, "Planet in Peril." What we've found, no surprise, is that it's hard to shoot these reports as well as do a nightly broadcast from the Amazon. So that's why I haven't been on the show as much as I'd like this week. I hope you understand. I'll see you tonight, and we'll see if the dye has rubbed off my arms by then. Finally, after two sweaty days in the jungle, a couple of mosquito-filled, sleepless nights, and parsimonious meals of power bars, I got to take a shower. It felt great, but no matter how much I scrubbed, the bluish-black dye, which the Kraho Indians had ceremoniously painted on my arms, wouldn't come off. These garish bands of ink, which was harvested from the fruit of a local palm, may have some folks thinking I just robbed a bank and got nailed by the ink bomb in the money bag. But truth be told, it's a stigma I'm willing to live with. The Kraho village and the lush jungle surrounding it is a place I'll never forget. Rarely does one get a chance to spend time with a people who truly depend upon and live off the land around them. The Kraho do so in a manner in which their culture seems as if it is completely integrated into the natural world. The genuine hospitality they extended to Anderson, the crew and me is something I will treasure. Mornings and afternoons were spent exploring the Kraho culture and their struggle to conserve their way of life in a region that seems, at times, to have failed them. Evenings were spent trail-blazing through dense jungle in search of secretive creatures. I must confess that the rain forest at night, alive with a cornucopia of nocturnal life-forms awaiting discovery, is one of my favorite places on earth. Amazingly, 80 percent of the creatures living in a tropical rainforest are nocturnal. Many of them inhabit the blanket of leaves making up the canopy high over head. It's often hard, if not downright impossible, to spot them. But when my eyes meet theirs, illumined by the eerie glow of a head lamp, adrenaline seems to surge through my veins. Anderson did quite well sloshing through hip-deep muck and trekking into the near impenetrable vegetation. Although a rather curious bat seemed to get the better of him, but only for a moment. Until, that is, the bat decided to swoop by once again. A person rides a snowmobile past the snow-covered Wesleyan Church in Redfield, New York, after a weeklong series of squalls. You probably haven't been to Redfield, New York. You probably haven't heard of Redfield, New York. But Redfield is now famous. At least meteorologically. The town of some 600 people northeast of Syracuse has one of the highest accumulations of snow from one weather system in New York history. Redfield recorded 141 inches of snow from the same lake effect system that began on February 3rd and continued through the 12th. That's 11 feet 9 inches of snow. And now, even more snow is arriving. We're used to seeing huge drifts in northern climes from snowplows. But the snow mountains in Redfield are just from accumulation. I actually stood on somebody's roof and walked down to the ground on a snow mountain just for kicks. And it's not out of line to do things like that because people are pretty laid back about the snow. Where I live, in Atlanta, two inches of snow would induce some panic. But the attitude in Redfield is, let it snow. Houses are very dark because the snow covers the windows and a lot of businesses shut down so there's not a lot to do. People end up spending a lot of time in the houses. As it turns out, huge amounts of snow seem to promote family togetherness. And that, it seems to me, is a pretty good reason to live in a place like Redfield, New York. Are we killing our planet? 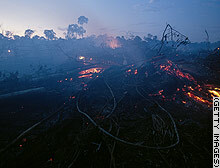 The aftermath of deforestation in the Amazon rainforest. The trees are pushed over with a bulldozer and left to dry before being burned. We're launching a really cool and ambitious undertaking I want to tell you about....it starts tonight with Anderson in the Amazon rainforest. But I want to begin with what I think is an interesting disconnect. We've all seen the disturbing stories of polar bears drowning because the ice floes they depend on are melting. We've also heard about the very recent emergence of a new island on the tip of Greenland. It had been thought to be a contiguous part of Greenland, but the receding (melting) ice sheet over Greenland has revealed it to be an island. All of this seems to be heading toward the final round in the global warming debate: Are warmer conditions in the Arctic and elsewhere due to a cyclical climate pattern or are we (the "we" all over the planet) actually causing it? The UN Intergovernmental Panel on Climate Change recently pointed a big finger at "us" when it issued a comprehensive assessment on global warming and rising sea levels. Here's the bottom-line: The report concludes it is 90 percent certain that human activities are the primary cause of global warming. So where is the disconnect? It largely seems to be political. While 57 percent of the general public believes global warming is a proven fact, according to a recent poll, roughly 61 percent of Republicans believe global warming has not been proven. And that brings us back to this new undertaking for our show. Over the weekend, Anderson and team flew from New York to Miami to the city of Belem in Brazil and then to Araguaina in the Amazon rainforest, where we expect Anderson to broadcast from tonight. This marks the first of a series of reports called "Planet in Peril" that we plan to produce throughout the year from all over the world. Anderson may well turn up in Madagasgar, China, the Arctic, Cambodia, the Florida Everglades, and perhaps some other locations as well. Animal Planet's Jeff Corwin is joining Anderson on most of these trips. Our plan is to go and examine in person many of the places and issues Al Gore mentioned in his film, "An Inconvenient Truth." If his film is a classroom lecture, this is the field trip. We don't think you can understand one piece of this environmental puzzle without also looking at the surrounding pieces. They are all interlocking: global warming, deforestation, population growth and species loss. This project promises to generate a mass of information on these subjects that we'll try to sort out as we go along. As we follow these issues around the world in the next few months, we very much welcome your thoughts. Cpl. Trent Thomas told a judge he believes he acted with lawful authority. Like most people, I was horrified and disappointed when I heard that U.S. troops had been accused of murdering innocent Iraqis in Haditha and Hamdania. But as a journalist I wanted to know more. I wanted to know what would drive soldiers to commit these types of acts. I wanted to know more about the psychological conditions under which they operated. I found Cpl. Trent Thomas' story particularly intriguing. Thomas grew up in a rough neighborhood in East St. Louis and by all accounts is a man who beat the odds. He didn't turn to drugs or violence; instead, he says he turned to his faith and church and family. Joining the Marines was something he always wanted to do. On April 26th of last year, Thomas and other members of his squad were searching for an insurgent in Hamdania, Iraq. Frustrated at being unable to find him, they went to his next door neighbor's home, 52-yeard Hashim Ibrahim Awad, lured him out his house, then shot and killed him on the street. But Awad, the father of 11 children, was not an insurgent. The squad then tried to cover up Awad's murder to make it look like he was an insurgent planting a bomb. After talking to Thomas for just a few minutes, I could see how conflicted he was. Thomas said he was sorry for what he had done to Awad. But I still got the sense that his entire experience in Iraq hadn't really sunk in. Thomas served three tours in Iraq. He had seen his best friend killed. He told me he would wake up each day and never know if he would survive to see the next one. He said battle fatigue and a general sense of frustration at not being able to stop insurgents played a role in Awad's killing. I asked Thomas if he was following orders the day his squad killed Awad. He wouldn't directly answer and appeared to be holding something back. After the interview I had a private conversation with Thomas' attorney. At the time, it was off the record. Following the talk with the attorney, I knew Thomas felt he was following orders that day. One day after our interview, Thomas changed his plea to "not guilty." His lawyer then said publicly that Thomas withdrew the guilty plea because he believed he was doing what he was told to do. The case, which had been in the sentencing phase, will now start over. Regardless of how the legal case proceeds from here, Thomas still has to come to terms with being a Christian, a Marine, and a man who has killed.